Stylus cleaning is a difficult task. Oh yes, you can easily remove the dust that accumulates between the stylus, the cantilever and the cartridge body but REAL stylus cleaning is another story. You maybe can remember Linn advicing to use a fine sandpaper to clean the stylus of the Linn cartridges. The problem is not only the dust that accumulates, but also a kind of dirt the stylus takes away from the bottom of the grooves so a more radical action has to be taken. This little device is not meant for audio use but we will force it to our ...desires. It is called Glasrubber, made in Germany by DBGM, costs 6 $ or so (two spares included) and it is meant for cleaning and erasing technical designs, slides, transparencies etc. Actually it is not so easily available today thanks to CAD design and mega-plotters but you can start your search at your nearest store that sells stuff for technical design, at a stationer's shop and the like. 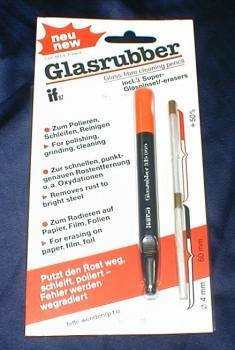 The Glasrubber is like a pen with a soft tuft (brush, that is) of glass-fibers that can be adjusted in "lenght" so to make the erasing (abrasive) action more or less effective, depending on our needs. You just adjust the lenght of the brushes with a turn of the orange cap (see picture). Easy. The Glasrubber cleaning and abrasive properties are simply stunning: take a rusted bolt, for example, and gently brush with just 2-3 mm of brush "exposed". Apply a gently pressure and after a few seconds the bolt will shine like it was new. During operation you will notice that tiny pieces of glass-fiber detach from the brush. DO NOT touch them as they are like small annoying thorns. Adjust the lenght of the brush so that its fibers become softer (4-5 mm should suffice). Brush the stylus following the direction of the action of the grooves while playing, apply an extremely gentle pressure on the stylus and, if possible, use a magnifying glass to control the cleaning action. 10 times should suffice to clean even the dirtiest stylus. You can do the same with the cantilever, too, sometimes it gets as dirty as the stylus. The key for a correct and SAFE cleaning procedure is to use "velvet" hands and fingers...brush gently and always following the direction of the grooves (from the back of the cartridge to the front). WARNING : be extremely careful, do not brush in different directions and avoid the tiny glass fibers reach your fingers or recessed parts of your turntable. In order to do this, place a soft cloth on the turntable, right below the operating area (below the cartridge, that is), so that you can collect the glass thorns and put them away after operation. We are, by NO means, responsible for any damage you can cause to your stylus, cartridge, turntable, system, hands and eyes. Follow the instruction carefully and, if in doubt, do not use it. The Glasrubber is a wonderful device for cleaning other parts of your HiFi system that are prone to oxidation, for example RCA pins, old contacts and selectors etc. And now go out and hunt for it. Then find a safe place for this smart tweaker toy.